I recently came across this series of old videos of the Harbour Bridge, one from shortly after it’s opening and one from during the construction of the clip-ons. It’s interesting that even back when the bridge opened, detailed counts of traffic were being taken. It would be interesting to know if that data still exists, of if it’s been lost to the mists of time. But I do have some high-level numbers. 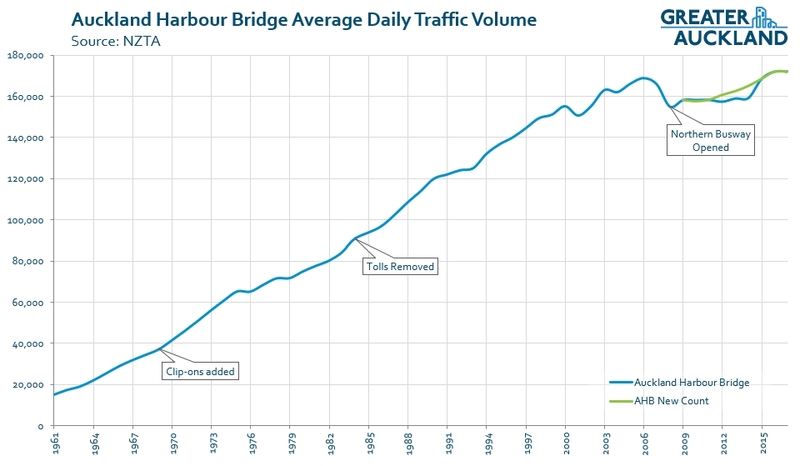 The graph below shows the average annual daily traffic volumes over the bridge from 1961 onwards. As of 2017, around 172,000 vehicles per day cross the bridge and of course many more people are crossing thanks to the Northern Busway. One thing I also heard recently is that in some ways we’re lucky we were able to add the clip-ons. The bridge was originally designed to be five or six lanes but to save money, it was scaled back to four lanes. Apparently, the designers working on the bridge simply didn’t have time to change the design of the foundations to match the new structure and so they were built as is. But those stronger foundations were what made the clip-ons possible. The clip-ons plus more recently the Northern Busway have helped delay the need for another, very expensive, road-based crossing, possibly indefinitely and with the way Auckland is developing, the next crossing is likely to be a PT only crossing (or PT + active if we build a bridge). That drop in ADT when the busway opened should have been enough to justify bus-only lanes on the bridge – it looks like a 1,500 vehicle per hour reduction! If it were true that the GFC caused the drop then we’d have seen a similar drop in previous economic downturns. Why would the GFC cause such a drop but no other downturn? I have to wonder if the bridge tidal system with the transfer barrier is actually still effective. Traffic heading south from the North Shore from mid afternoon to evening is getting worse – sometimes almost backed up to Tristram ave, and caused by the 3 lane bottleneck of the Harbour Bridge. It seems to be far worse than the traffic heading north. Or is there perhaps a better way to merge the lanes? Once traffic has reached the arch of the bride, traffic then seems to ease out. Maybe a better system than changing the number of general traffic lanes at different times of day, they should allocate some lanes to be bus lanes at peak times. Actually using the buses daily, I noticed that the bridge itself isn’t usually a problem – what is a problem is the Curran Street on-ramp, or alternatively lack of bus lanes northbound between Fanshawe and Curran Street on-ramp. That is what slows things down. The weirdest thing is that on that very section there is a southbound bus lane, that very seldom needs to be used. Only and if only NZTA thought about it properly, they would’ve shifted the road layout to have the bus lane northbound instead. That can still be done (up to Shelly Beach Rd bridge perhaps), but would definitely be very expensive. We raised this at the time. The response was a bus lane wasn’t needed because the modelling showed that the motorway wouldn’t every get congested northbound through St Mary’s Bay, so the buses were fine. I hope they didn’t actually believe that themselves. What a gorgeous find, Matt! Loved it. Loved the radar and tuning fork for monitoring speeds. Thanks. Great when old videos make me think about stuff I should know. So if you break down on the bridge just let your kids out of the car so they can wander around in the lanes. and go along to use the phone, because otherwise no one will know you’ve had a problem. Too good to be true!!!! !……………..especially if you want to live! Does anyone ever run out of petrol these days? Point Chevālier — does anyone pronounce it that way today? No. I’ve never heard anyone say it in that English way with but one open ā sound. If we’re adding swank for effect we make sure we drawl out the Sher and definitely Pwah the point. His accent was but mildly evolved from the BBC-esque accent required by the National Broadcasting Service of the 1930’s and 1940’s. There’s a growing local call to change the name to Rangi-mata-rau, since Chevalier was not important, and neither remembered nor admired today. Interesting the tolls were predicted to pay of the construction costs by 2008, but that was achieved in 1984. Remember when they used to have patrol vehicles – special traffic officers for the bridge, equipped with grunt Landrovers, and big bumpers. If you broke down (as old British cars did frequently in those days) they would just shunt you up the hill and let you roll down the other side – the ethos was: keep the traffic flowing! Classic videos, remember my dad grabbing for the 20c I think it was to give the man in the both to go through in the 1970’s.